Margaret Pole was the daughter of George, Duke of Clarence and Lady Isabel Neville making Margaret niece to both King Edward IV and King Richard III. Margaret would have had a claim to the English throne had it not have been for the attainder passed against her father after he was executed for treason. During King Richard III’s reign Margaret and her brother, Edward, Earl of Warwick, were kept at Sheriff Hutton in Yorkshire until Richard was defeated by the hands of Henry Tudor’s army at the Battle of Bosworth. After this Margaret’s brother was taken into the Tower of London only to be seen once in 1487 before he was eventually killed as he was considered a rival to the throne and the focus of the rebels cause. Margaret, however, was married of to Henry’s cousin Sir Richard Pole in an attempt to make her forgotten by marrying her to a lowly courtier. Sir Richard Pole was created Chamberlain for Arthur Tudor, Henry’s eldest son and when Arthur married Katherine of Aragon Margaret was one of her ladies in waiting. The Pole’s would be at Ludlow Castle until Arthur died in 1502 and Richard was put in charge of the Welsh Marches. Sir Richard and Margaret Pole had five children when Richard died in 1504 and with the death of her husband Margaret was left with limited land and no income and so Henry VII paid for Sir Richard’s funeral to help ease the financial burden. Also to help her family Margaret arranged for one of her sons, Reginald, to enter the Church. Reginald’s relationship with his mother was to be strained after this and he had a career that eventually led him to be Archbishop of Canterbury during Mary I reign. With Henry VIII coming to the throne after the death of his father Margaret was again appointed a lady in waiting to his new wife and Margaret’s former lady, Katherine of Aragon. Henry was very favourable to Margaret and restored some of her brother’s lands to her at the cost of 5000 marks. She was restored the lands of the Earl of Salisbury making her one of only two ladies in England to be a peer in her own right and by 1538 Margaret was the fifth richest peer in England. Margaret’s other children became favoured by the new King, her eldest son Henry was created Baron Montagu and her second son Arthur was a Gentleman of the Privy Chamber. Margaret’s daughter, Ursula, married Henry Stafford and her youngest son, Geoffrey, married the daughter of Sir Edmund Pakenham. Margaret’s favour continued when she was made Princess Mary’s Governess and she remained loyal to Mary. When Mary was declared illegitimate and her household was broken apart Margaret asked to remain with Mary at her own cost, a request that was turned down. Even the Imperial Ambassador, Eustace Chapuys, suggested to the King that Mary was kept with Margaret again Henry refused calling Margaret ‘a fool, of no experience’. The Plantagenet name remained a strong name in England and when Henry began to turn away from Rome the north began to rise and the Pole name, in particular Reginald, was a name that the rebels would march behind. Henry began investigating the rebels and Sir Geoffrey was arrested after being found communicating with Reginald. Under interrogation Geoffrey admitted that Lord Montagu and his mother as well as Henry Courtenay had all corresponded with Reginald as well. They were all arrested in Novemnber 1538. January 1539 saw Geoffrey pardoned and released but Lord Montagu and Henry Courtenay were executed on the charge of treason. All those arrested were attainted this included Montagu and Courtenay who were already dead. As part of the evidence for the attainders Thomas Cromwell had produced a tunic worn by the Pilgrimage of the Grace that bore the symbol of the Five Wounds of Christ. This was enough for Henry to condemn his mother’s cousin to death. 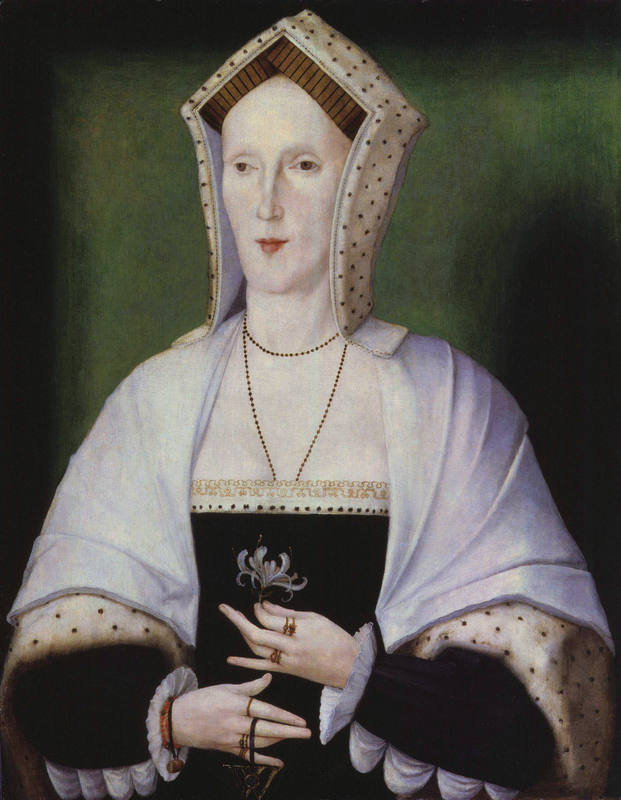 Margaret Pole and her grandson, Henry and Courtenay’s son were held in the Tower of London where they would remain for the next two and a half years. On the morning of 27th May 1541 Margaret was informed that she was to executed within the hour and prepare herself. Her execution is remembered as being one of the most horrific. A block was prepared and 150 witnesses were there to see the former Countess of Salisbury die. Margaret was dragged and forced to place her head on the block and the executioner took his first swing, missing Margaret’s neck completely and hitting her shoulder. It allegedly took a further 10 blows before Margaret died. She was later laid to rest in the chapel of St. Peter ad Vincula in the Tower of London. Prince Arthur Tudor died on 2nd April 1502 only five months after his marriage to Katherine of Aragon. The eldest son of Henry VII and Elizabeth of York, Arthur was the heir to the English throne. After his lavish wedding to Katherine of Aragon the newlyweds were sent to Ludlow Castle where the Prince of Wales was to learn to be King and also rule over the principality of Wales. After a brief stay at Tickenhall Manor, Bewdley the couple set off for Ludlow. Ludlow Castle was a luxurious palace but it was also cold. After a particularly bitter winter in late March 1502, both Arthur and Katherine fell ill. It is still a mystery what struck the new royal couple; the most common theory was they were struck by the sweating sickness that had swept the country. Katherine battled through the illness and survived; however, Prince Arthur Tudor succumbed to it and passed away at the age of 15. A courtier was dispatched immediately for London to break the news to the King. On 4th April Henry VII’s confessor was sent to wake up the King and inform him of the death of his son and heir. Henry broke down in tears and his wife was called upon to comfort him. Elizabeth of York informed the King that they were still young and could have more children and they also had Prince Henry. After leaving the King Elizabeth walked back to her chamber but on the way collapsed on the ground and was inconsolable. Her ladies in waiting called for the King who came and comforted her. Arthur’s body remained in Ludlow but on 8th April in London a procession took place for Arthur’s soul and at St Paul’s in the afternoon a dirige (service for the dead) was sung. Meanwhile in Ludlow Arthur’s body was disembowelled, embalmed and wrapped in a wax cloth before being placed in a coffin. Arthur was laid to rest in his chambers where his people came to pay their respects. At some point his heart was buried in Ludlow Church. 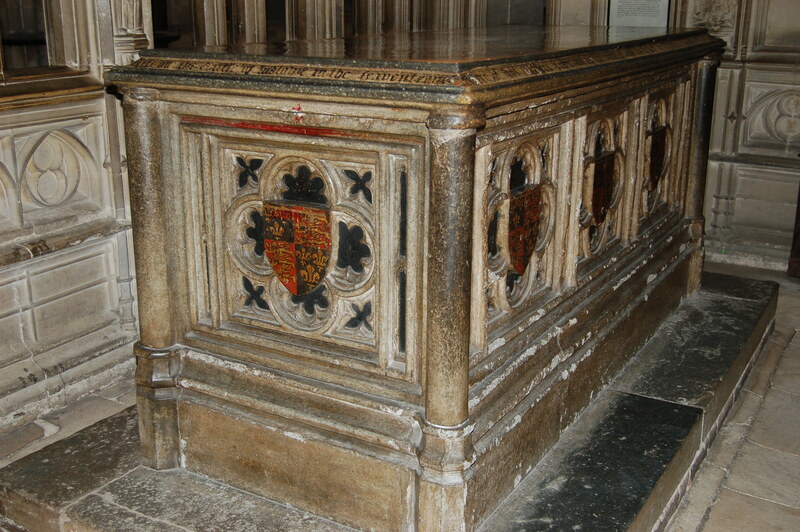 Henry lay in state within his chambers at Ludlow until 23rd April while his lavish funeral was planned. Worcester Cathedral was chosen due to it being the closest Cathedral to Ludlow that was not affected by the sweating sickness. On the 23rd Arthur’s body was sprinkled with holy water and was transferred to Ludlow church. His body was covered by a canopy as it travelled the short distance. A large procession accompanied the cortege including many gentlemen of Arthur and Katherine’s court. Arthur’s body was placed in a hearse and remained guarded in Ludlow castle overnight. The following day the traditional three masses were held. They were for Our Lady, of the Trinity and of the Requiem. Following these events dinner was held at Ludlow Castle. On 25th April one final requiem mass was held in Ludlow Church before Arthur left Ludlow to begin his final journey. Due to the long journey ahead a special wagon was commissioned that was covered in black fabric and drawn by six black horses. The cortège travelled slowly through the countryside accompanied by Arthur’s gentlemen, bishops, the prince’s banner bearer and the officers of arms. Also following the cortège was 120 torch bearers. At the end of the first day the procession arrived at Tickenhall Manor, Arthur’s home in Bewdley. Arthur’s body was laid to rest overnight in his chapel. After another requiem mass on the morning of 26th April the cortège set off for the final part of the journey towards Worcester. Huge crowds turned out to greet the cortège. Arthur’s body was placed in the Cathedral choir. Arthur’s funeral on 27th April was a magnificent affair and no expense was spared. A mass of requiem was offered. The Earl of Surrey acted as the chief mourner and alongside the officers of arms offered up Arthur’s heraldic accomplishments which were his coat of arms, shield, sword and helm. Also an unusual event happened as Arthur was a prince of the realm a knight on horseback rode down the length of the Cathedral to the choir where he dismounted and approached the presiding bishop’s. Finally it was time for Arthur’s burial, prayers were offered to Arthur’s soul and finally the prince’s servants and gentlemen ushers broke their staffs over their heads and cast them into the grave. This signalled the end of their service to Arthur now they have committed him to the ground. Henry VII spared no expense with Arthur’s funeral with it costing £892. Katherine of Aragon, King Henry VII nor Elizabeth of York was present at Arthur’s funeral. Katherine was still recovering from her illness and the King and Queen did not like to be around death and mortality, also it was believed that Worcester was suffering from the plague. 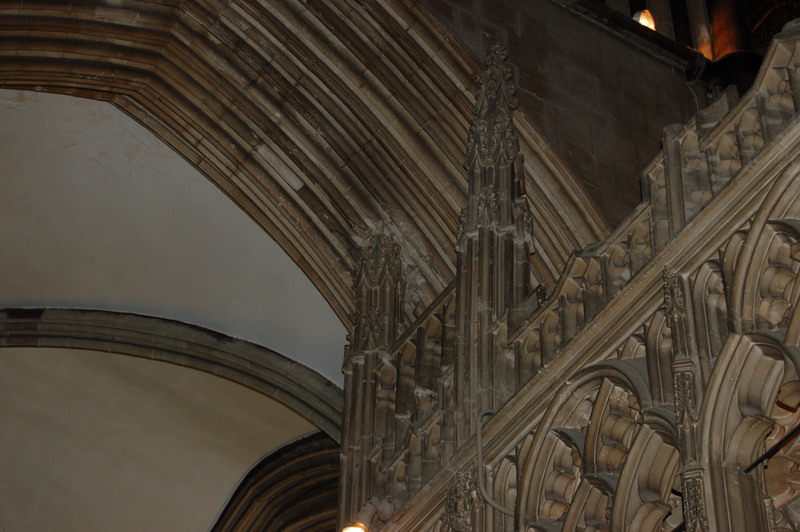 Two years later a chantry was placed above where Arthur was buried. However, the chantry remained incomplete many shields remained uncut. 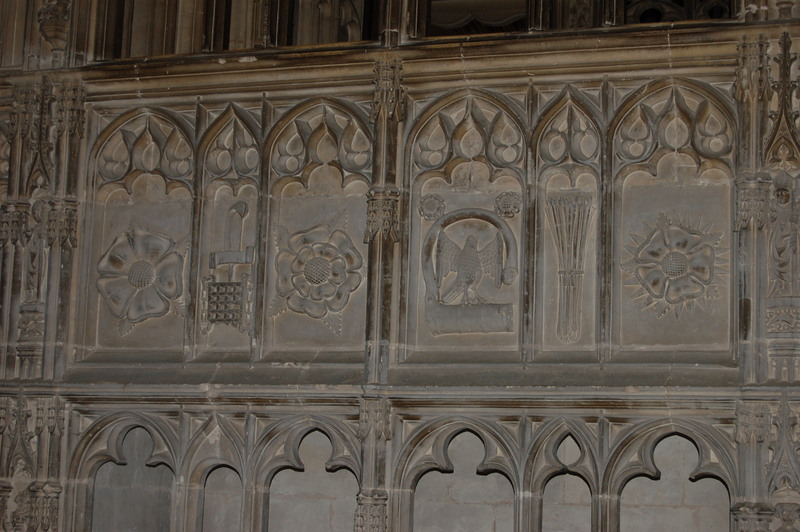 On the outside of the chantry are 19 panels that contain a random combination of the following; the ostrich feather (Arthur badge as prince of Wales), a single rose, the rose en soleil and eagle and featherlock (Yorkist badges) the Beaufort portcullis (now a symbol of parliament), the fleur-de-lis (for Arthur’s great grandmother Katherine de Valois), the pomegranate of Granada (for Katherine of Aragon) and finally arrows in clusters (for Katherine’s father). It is believed these were added at a later date as the stone is different to the rest of the area and the workmanship appears to be poorer than the rest of the chantry. Arthur’s tomb is very different to the rest of the chantry, which makes some historians believe it was commissioned years after Arthur’s death. 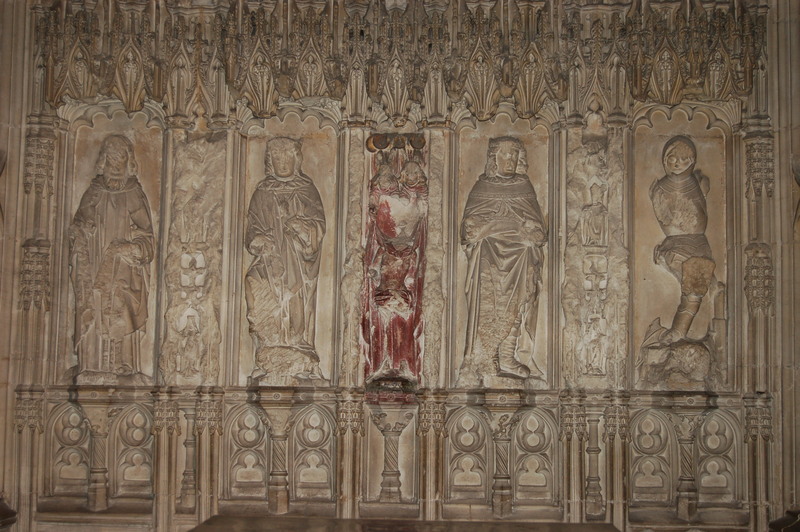 It is of a similar design to King John’s tomb which was commissioned in the 1520’s. The inside of Arthur’s chantry was also damaged during one of the attempts to dissolve the monasteries. If you look carefully at the top of Arthur’s chantry you will see that the tips of the turrets have been damaged and removed. 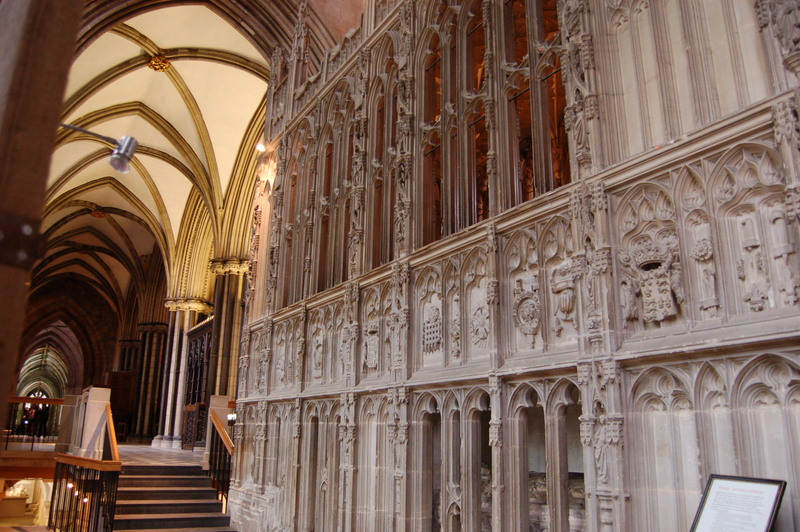 Upon talking to a tour guide at Worcester Cathedral it was believed that either the chantry had been moved at some point or it was made in London to the wrong dimensions and when it was assembled it Worcester it did not fit the designated area. Arthur’s chantry is a wonder to see although it does feel a bit neglected as if work was not completed by the time of Henry VII’s death and Henry VIII did not continue the work as he wanted to be the centre of attention especially as he was married to Arthur’s widow, Katherine of Aragon.